Economists fear Canada's debt loads could soon burn the economy. “It’s time to drop any negativity around the Canadian economy,” Bank of Montreal economist Benjamin Reitzes declared in a client note Friday. Canada’s economy has grown at a 3.5-per-cent pace over the past three quarters, a rate generally not seen since the good old days before the Great Recession of 2008-09. Quebec just recorded its lowest unemployment rate on record. Nationwide, there are 1.8 per cent more jobs today than a year ago, well above population growth. The Toronto and Vancouver housing markets have been on fire in recent times, but many experts fear excessive debt will burn the economy. So why are so many experts — from the Bank of Canada to the OECD to private economists — sounding so concerned about the risks in Canada’s economy today? Simply put, it’s because they’re worried that the growth is coming from the wrong place. Rather than coming from business investment across various sectors of the economy, strength is concentrated in the housing market — which appears to have peaked. That means Canada's economy is increasingly dependent on households taking on more debt — even though Canadians' debt loads are already the highest among G7 economies. And if those debt loads grow too far, these housing markets that are on fire today ... could simply burn down. Economic growth has been concentrated in housing-related industries in recent months. Some experts worry Canada has put too many eggs in one economic basket. “The incoming data over the past several weeks provides further evidence that the housing market is on the verge of a potentially severe downturn,” Capital Economics’ senior Canada economist, David Madani, wrote in a client note Friday. Indeed, on a month-to-month basis, home prices did slide in Toronto in May, the first full month that Ontario's new housing rules were in place. The average selling price for all housing types fell by $57,000 from April to May, to $863,910. But experts are quick to point out that one month of data doesn't make a trend. 'Fire sales' in Toronto's housing market? 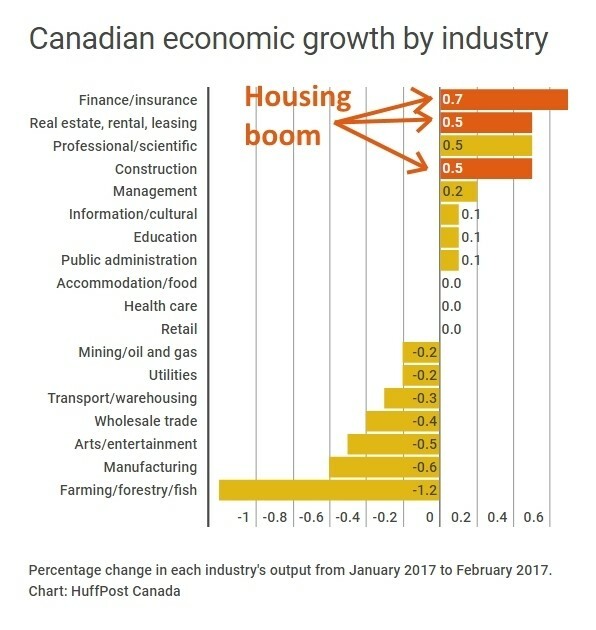 While the Bank of Canada sounded a more optimistic note in its latest Financial System Review last week, suggesting only a slim chance of a major housing correction, the almost obsessive focus on household debt and house prices in the report clearly signalled the bank is worried. Even though the economy is being held up by “strong fundamentals … these fundamentals cannot readily explain the pace of the price increases seen in the GTA over the past 18 months,” the bank said. It hinted clearly that speculation is driving up house prices in Greater Toronto. Bank of Canada governor Stephen Poloz holds a press conference at the National Press Theatre in Ottawa on June 8, 2017. While the bank sees only a “moderate” chance of a housing correction, the bank’s governor, Stephen Poloz, used even stronger language last week, saying “anything” could bring down the housing market at this point. “The longer [speculation] goes, the bigger it gets, the more you start to be concerned that not necessarily a global recession, but just about anything could be responsible for causing a correction in housing,” Poloz told reporters in a press conference. If the Toronto and Vancouver housing markets were to turn down, it would primarily hurt those cities, the bank wrote, with only a limited spillover to the broader economy. Capital Economics disagrees, and has already pegged how much damage a housing slump would cause. “Considering that Toronto accounts for 20 per cent of the national housing market, this slump in sales will hit national second-quarter GDP, subtracting as much as 0.5 percentage points” from Canada’s economic growth, Madani wrote. Slowing or even falling house prices in Toronto “might discourage households from using their homes as an ATM, potentially slowing growth in household consumption later this year,” he added. So are we headed towards a debt crisis, or will the boom times continue? No one can say for sure at this point, but Bank of Montreal CEO Bill Downe had some big-picture words of advice last week, reported The Canadian Press. When house prices decline, people tend to stay in their current homes and pay down their debt, Downe said at the Canadian Club of Toronto on Thursday. That would, in effect, fix the debt problem Canada is facing. That’s what happened in the U.S. after its housing bubble burst, and even though Canada’s situation is different, Downe believes that would happen here too. The market “essentially heals itself,” he said.